Arm and Hammer Sensitive : When you think of ARM and HAMMER® Baking Soda, you think of our little yellow box. That box has a lot of history – and the high quality it represents is appreciated by a new generation. For more than 165 years, people have chosen pure, versatile, effective, environmentally safe and economical ARM and HAMMER® Baking Soda for baking and countless household & personal care uses. Today, consumers appreciate that ARM and HAMMER® Baking Soda is an effective, yet gentle cleaner and a real alternative to using harsh chemicals, which makes it great for use around food, kids, and pets. It can also be used to replace other household and personal items that may have ingredients that are harmful to the environment. (Read More) . 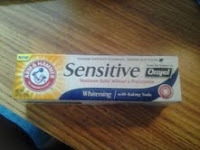 I received a free sample of Arm and Hammer Sensitive from my favorite sample communities Smiley360 to sample and review. Everyone brushes their teeth (or should) but the fact that not everyone uses the right tooth paste for their dental needs. I used to use regular cheap tooth paste, and some will argue that it's all the same just different prices, which is true in some detail, but not always the case. I have tried almost every brand on the market and some are better than others. I used to use regular toothpaste until recently. When I was sent the Arm and Hammer Sensitive whitening toothpaste with orajel. I have to face it, my teeth are white but no where as white as I would love them to be, and they have just recently become really sensitive to cold liquids. The Arm and Hammer Sensitive is low abrasive so it doesn't cause sensitivity, which is a great plus for my husband, because his mouth is so sensitive to certain toothpaste and other products. This tooth paste has fluoride cavity protection, has an effective stain removal, it freshens breath, and deep cleans. I love that this toothpaste is combined with Orajel because it relives painful tooth and nerve sensitivity which I have recently. Alot of people have sensitivity towards hot and colds, mine happens to be cold liquids, the first day of trying my sample I was brushing my teeth with it and I went to rinse with cold water and the pain struck! it felt like a ice pick in my teeth. When I spit, I said I said I sure hope this stuff works! a week later when I rinse with cold water I can hardly notice the cold water effecting my teeth hardly at all. So within maybe another week , I am pretty sure I will have no sensitivites towards colds at all. I will be soon having my husband using this tooth paste to help with his sensitive teeth needs. 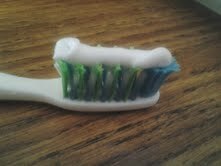 I love how fresh my mouth is after using this toothpaste, and I love how clean my teeth is after each use! no more fuzzy slippers. ♥ I receive no monetary compensation for this review. I was provided Arm and Hammer Sensitive from Smiley360 to try and give my honest opinion(s).